This is the second book from Bert Vreeswijk. It’s in the Dutch language. 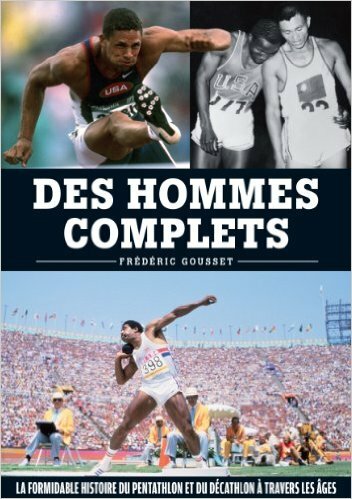 The first one was about Decathlon training. This second one is about Women Heptathlon training. A to Z heptathlon with very nice illustrations. Full colour, 180 pages, beautyfull pictures. National coaches, toptrainers from the Netherlands and Belgium gave advice to this work as well as interviews’ with Olympic top athletes are added, sharing their knowledge and experience with us whenever we are fan, multi eventer, trainer, coach or athlete. 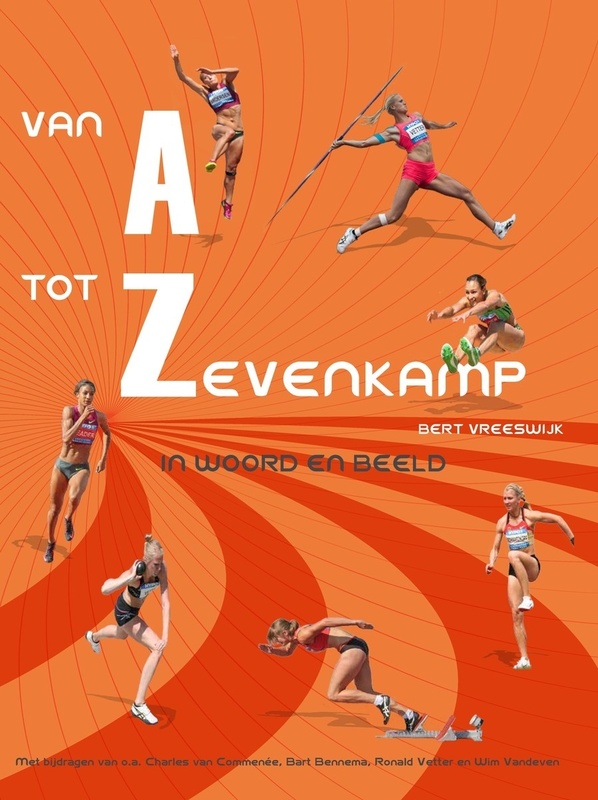 Both works “Tienkamp totaal” and “Van A tot Zevenkamp in woord en beeld” are together making a complete work about the Olympic multi events. To order go to the site www.tienkamptotaal.nl with detailed information and short movies of technical aspects. Release date - June 24 2016. Complete men is the story of a passion which crosses time and continues today with the promises of fights to come. The moderns Olympic Games of Stockholm in 1912 updated the “All-around men” in a European way, by replacing from now on the heavy throws by discus and javelin, unknown at that time in the US. Ten contests in two days, it’s the new size which was imposed and remained unchanged, in spite of the numerous criticisms which were accumulated, as long as this event remained confined to the Olympic terms. Too thankless, and not spectacular, nor gratifying. Decathlon was even compared with the Roman circus. Who are the strongest men of all time? Strength researcher Dale Harder wrote bios of 155 of the world's most amazing strong men and their feats from both the past and the present. 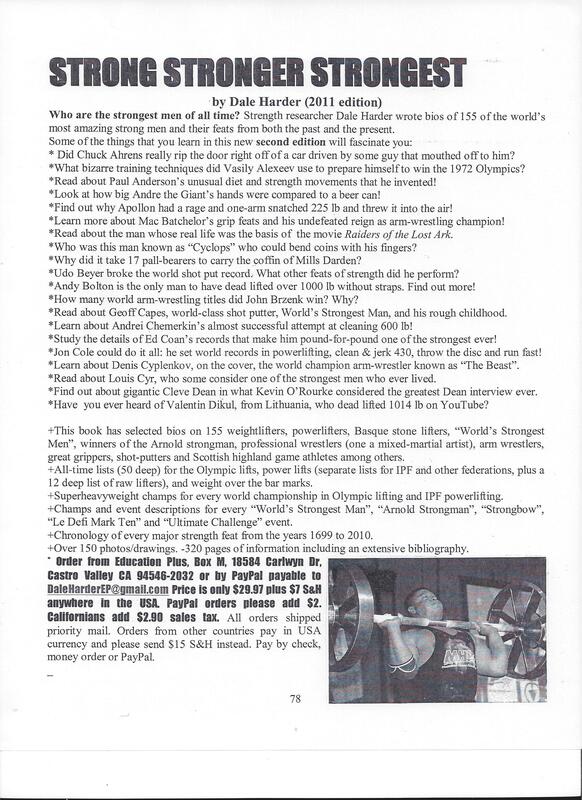 This book has selected bios on 155 weightlifters, powerlifters, Basque stone lifters, "World's Strongest Men", winners of the Arnold strongman, professional wrestlers (one a mixed-martial artist), arm wrestlers, great grippers, shot-putters and Scottish highland game athletes among others. Fun facts book like a combination of Guinness World Records & Ripley's Believe It Or Not. 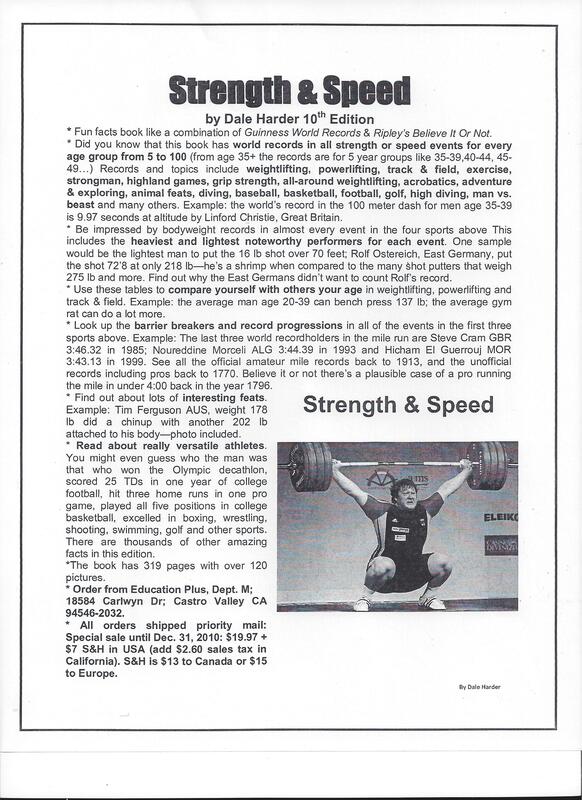 Did you know that this book has world records in all strength or speed events for every age group from 5 to 100 (from age 35+ the records are for 5 year groups like 35-39,40-44, 45-49...) Records and topics include weightlifting, powerlifting, track & field, exercise, strongman, highland games, grip strength, all-around weightlifting, acrobatics, adventure & exploring, animal feats, diving, baseball, basketball, football, golf, high diving, man vs. beast and many others. Example: the world's record in the 100 meter dash for men age 35-39 is 9.97 seconds at altitude by Linford Christie, Great Britain.